Counsel Press' Richmond location was created in 1979 as Lawyer’s Printing and Research and was acquired by Counsel Press in 2000. 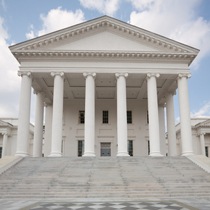 From this location we specialize in filing and service within the Supreme Court of Virginia, the Court of Appeals of Virginia the South Carolina Supreme Court, the South Carolina Court of Appeals and the United States Courts of Appeal for the Fourth and Eleventh Circuits. The Richmond office is one of Counsel Press’ sophisticated production facilities that produces our client's print and electronic filings. We employ the latest technology to connect, in real-time, each of our production facilities with our New York headquarters location so that we may offer all of our resources to each of our clients from coast to coast and in all time zones.